Spring is here, which means moving season has also arrived! Are you planning on selling your home soon? If so, home staging can help your home to sell quicker and for more money! So, what is home staging and why should I do it? Keep reading this post to find out! 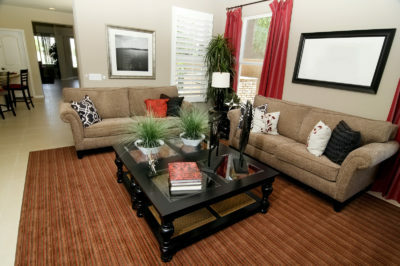 Home staging is a way of styling your completely furnished home in a way to make it appealing to many buyers. The goal of home staging is for your potential buyers to be able to picture themselves living in your home. While home staging can involve painting your bathroom and updating your kitchen tiles, it is generally much more than that. Try out these 5 home staging tips! Have a fresh eye look over your house: Since you see your house every day, you may have grown blind to potential eye sores that will stand out to someone touring your home. Have a friend or extended family member tour your home with the goal of pointing out any eye sores, areas that need decluttered or problem spots they can identify. Focus on the areas that matter: Certain areas in the home will matter less to buyers. When staging your home, focus your energy on the living room, kitchen and master bedroom. These 3 areas can make or break a home. Repaint dull rooms: It’s amazing how far a fresh paint job can go. If the paint in your home is looking chipped or outdated, repaint it. When choosing your paint color, it is important to pick a color that is neutral and will appeal to both sexes. Don’t forget curb appeal: The first thing a potential buyer is going to see when they pull up to your home is the outside of your house. Before putting your home on the market, power wash the exterior of your home, driveway and sidewalks. Take a look at your landscape and more flowers, bushes and plants wherever you see an opportunity. If your lawn is looking patchy, plant more seeds. Declutter the home: This step can be especially difficult if your family is still living in your home, but it is important to thoroughly declutter your space. When giving a potential buyer the house tour, they’re going to want to see everything. Inside of your closets, cupboards, basement and attic. Because of this, it can be difficult to find a location to store the items you decluttered. A storage unit rental allows you to get unneeded items out of the home and away from the eyes of potential buyers. Are You Looking for Storage While Selling Your Home? Are you looking for a storage unit to help with your home staging project? Look no further! Lighthouse Self Storage has storage facilities in in West Palm Beach, FL, Fort Lauderdale, FL, Homestead, FL, Whittier, CA, Westminster, CA and Oceanside, CA! With so many varying sizes, including the 5×5, 5×10 and 10×10 storage unit, we have a storage solution for any sized need. Reserve a storage unit with Lighthouse Self Storage today!